Leinster lost ground on their rivals at the top of the Pro12 table as the Dragons secured their fourth victory of the campaign by winning at the RDS. An early Patrick Leach try helped the visitors to a 10-6 half-time lead but Dave Kearney touched down to nudge the hosts 14-13 ahead in the second half. But Tom Prydie took his personal tally to 11 points with a vital penalty. 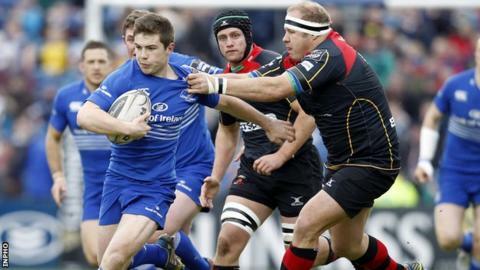 Leinster lie fifth in the standings while the Dragons are 10th, one point behind the ninth-placed Cardiff Blues. Winger Prydie converted Leach's 10th-minute try and booted three penalties, including the match winner with 11 minutes left, steering the Dragons to only their second win on Irish soil in 11 years. The 16-14 victory carries even more merit as the Welsh region had forwards Nick Crosswell and Rhys Thomas sin-binned in the first half. However, defending champions Leinster could only score two penalties to trail 10-6 at half-time. Jimmy Gopperth's third successful strike made it a one-point game, but he was unable to convert Kearney's try in the 66th minute and Prydie had the final say as the defending Pro12 champions suffered their first defeat at the RDS since March 2013. The Dragons took a surprise lead when centre Leach broke through the home defence, via excellent build-up play from Thomas and Dorian Jones, for a converted try. Although shorn of his Six Nations-tied players, Leinster boss Matt O'Connor was forced into further changes when Noel Reid and Tom Denton went off injured, and a third change saw Aaron Dundon come on for Richardt Strauss. Two Gopperth penalties in the 16th and 30th minutes opened Leinster's account, but even with the sin-binnings, the Dragons were proving a tough nut to crack and Prydie split the posts just before the break to give his side a four-point buffer. Reid's replacement Luke Fitzgerald appeared to have touched down 10 minutes into the second period following a magnificent run from Ben Te'o - only for referee Ben Whitehouse to award a five-metre scrum to the visitors, instead. The hosts had to be content with a third Gopperth penalty before Prydie cancelled it out with another accurate strike at the other end. O'Connor's side finally made the breakthrough past the hour mark. Te'o was once again the fulcrum of the attack and after receiving his neat offload, replacement scrum half John Cooney's kick towards the right corner was finished off by full-back Kearney. Gopperth was off target with the tricky touchline conversion, though, and the determined Dragons quickly retook the lead at 16-14 thanks to a close range Prydie penalty. That proved to be the game's decisive score as the region held on to win in Ireland for the first time since overcoming Ulster, by the same scoreline, back in September 2008. Leinster: D Kearney; McFadden, Te'o, Reid, Fanning; Gopperth, L McGrath; Bent, Strauss, Furlong, Denton, Douglas, D Ryan, Jennings (capt), Conan. Replacements: Dundon (for Strauss 3), McCarthy (for Denton 11), Van Der Flier (for Jennings 65), Cooney (for L McGrath 65), Fitzgerald (for Reid 11). Not used: Dooley, Hagan, Marsh. Newport Gwent Dragons: Tovey; Prydie, Leach, Dixon, Amos; Jones, J Evans; O Evans, R Thomas, Harris, Coombs, Landman (capt), J Thomas, Cudd, Crosswell. Replacements: Buckley (for J Thomas 28), Stankovich (for O Evans 42), Way (for Harris 72), Gough (for Coombs 72), Rees (for J Evans 69), A Smith (for Dixon 56).